Every gardener love new release garden plants and Diamond in the Dark Crepe myrtle is one that looks like a winner to us. Very deep red to black foliage is the star attraction. It is available in five flower colours, Deep red trough to white and a pink blush. This looks like a compact grower to us, it should reach around 3m in height with a spread of around 2.5m. 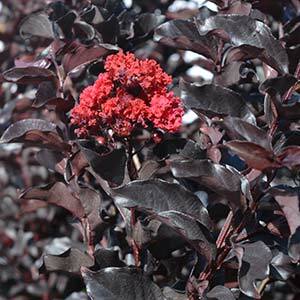 If you are looking for great foliage and flowers as well, Diamond in the Dark Crepe myrtle is one to consider. 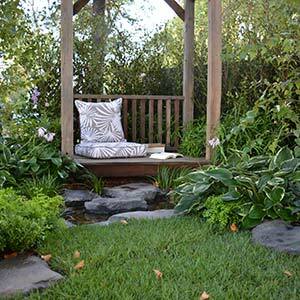 With outdoor living being high on the agenda in landscape design, a quite spot in the garden is one addition that can fit into almost any garden. Use of plants, stone and water, along with a Gazebo, all combine together to give us inspiration from a well conceived design. A well deserved winner of the Landscaping Victoria, Boutique Gardens Award. 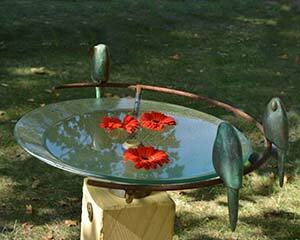 Folko Kooper is a Tasmanian sculptor who creates a range of Sculptures and Birdbaths for the garden. Folko works with corten steel, sandstone and glass along with other materials to produce a unique range of hand crafted items. Folko has been attending the garden show for many years, his sculptures never cease to amaze us and they attract attention from many gardeners form around the world. 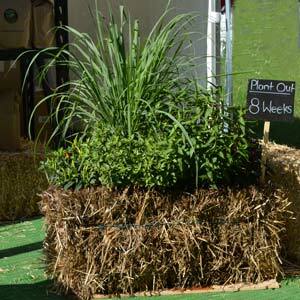 Relatively new to Australian gardeners, Straw Bale Gardening is very popular in the USA. Bale Grow is a new venture set up to show Australian gardeners how to go about this efficient method of growing vegetables and flowers. They can provide all of the resources needed and have the expertise to help you get started in the this innovative and easy method of gardening.